Another leaked Gamescom video has confirmed that a new type of engram called a "Bright Engram" will be included in Destiny 2. These pure white engrams do not appear to be based on RNG but are rather rewards for completing certain activities, most notably in the patrol environment. What we don't know so far is whether these Bright Engrams are superior to the well known exotic engrams, kind of like a sublime variety, or whether they slot between the legendary and exotic tiers. 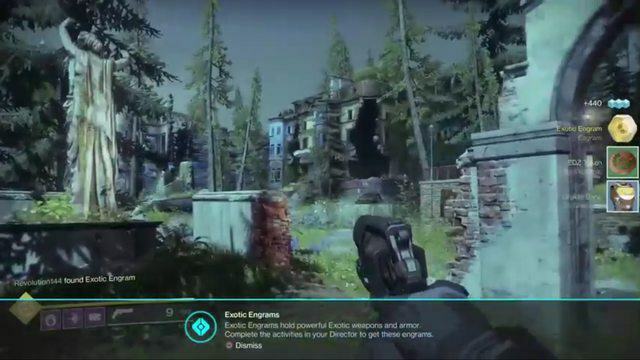 In the leaked gameplay we clearly see the marker text "Bright Engram Earned", slap bang in the middle of the screen following a patrol event. 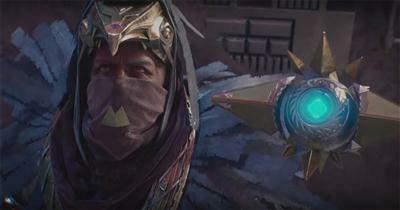 The event in question was a patrol activity called Glimmer Extraction, and upon completing the fourth phase the player earned the Bright Engram reward. What's also interesting is that during the very same video, the player earned an exotic engram and the onscreen text highlighted that exotic engrams can be earned from activities in the director, a change from the familiar RNG rules of exotics in Destiny 1. Originally it appeared that Bright Engrams would only be rewards for specific activities but further analysis of an IGN video confirms that Bright Engrams are also rewarded for filling up the XP bar after you reach max level. If you remember back to Destiny 1, every subsequent level up rewarded you with a Mote of Light. This is now replaced in Destiny 2. "You get bright engrams when you level up. They hold items for customizing your character. Tess Everis can decode them." As you can see, Tess Everis is the NPC that has the power to turn these engrams into rewards. She of course can be found at the new social space: The Farm. There's also another little clue in that sentence - note the term "customising your character". This is alluding to the fact that these engrams grant cosmetic rewards, which makes perfect sense given that Tess is the one decoding them. Now that Destiny 2 is out in the open, we have more concrete details about what Bright Engrams are. 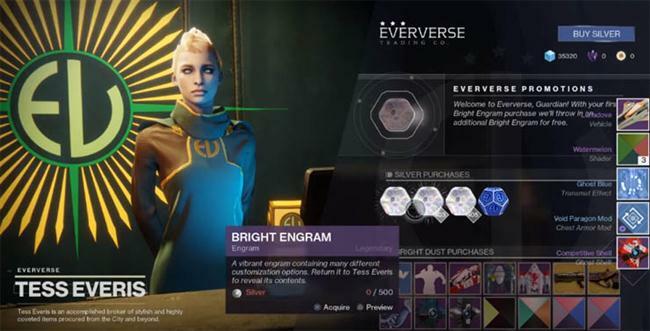 We always suspected these engrams would be decrypted at Eververse, but what is now also confirmed is that Bright Engrams produce power level 3 gear which can also be infused.